I realized yesterday that my friend’s daughter’s baby shower was only 2 full days away and I hadn’t though about what I would give her. This friend is great about making homemade treats for us at work, in fact, she’s the one that made my awesome birthday cake that I showed here. So, I didn’t want to only send her a store bought gift. 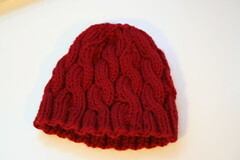 After a quick search on ravelry, I was in business with a cabled baby hat project that I should be able to complete in two days. I started it yesterday and finished it today (not the greatest picture since I finished it after dark). Around this time each year, I start to like cooking again. There is just something about cooler weather and the holidays that make me enjoy the art of cooking. Today, I made homemade bread, more specifically, monkey bread. 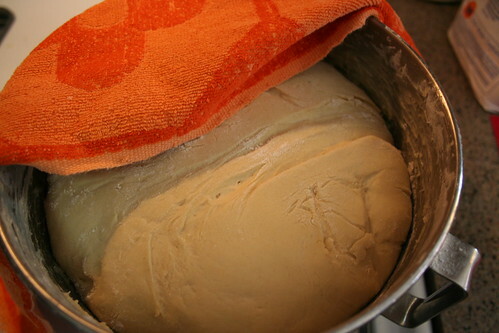 While it’s not a new recipe (it’s my mom’s recipe that she shared with me about four years ago), it is one that requires a little bit of luck (the primary instruction is to add flour until the dough feels right, soft but not too sticky), so I’m counting that as creativity. In case you are unfamiliar with monkey bread, you take the dough, dip it in butter and a sugar/cinnamon mixture and throw it in a pan. It makes great cinnamon bread. We glaze ours before serving with a little bit of powdered sugar glaze. My house smells SO good right now. I’m going to enjoy the smell as I spend a bit of time with my sewing machine starting the actual sewing of the kid’s costume. Mmmmm, monkey bread! I may have to make some of that this weekend — Hub will be thrilled! 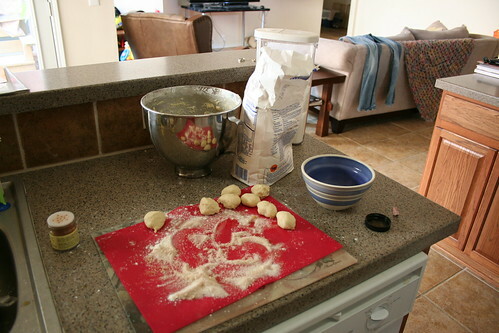 Another good variation on that is to make it garlic parmesan: add a clove or two of pressed or minced garlic to melted butter, and dip the dough balls in that and then in shredded parmesan (the real kind, not the sawdust kind) and bake. mmmm, i’ve always wanted to make monkey bread! ooh, inspirational. 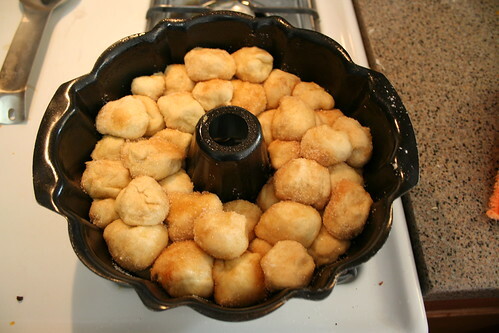 I think my household needs monkey bread this weekend! 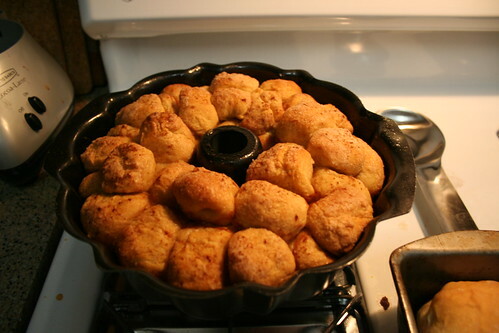 I’ve had (never made) monkey bread before, but the cook used prefab refrigerator rolls. Still mighty tasty! I love monkey bread!! – you’re making me hungry!